David Duke Carr  (born July 21, 1979) is a former American football quarterback who played in the National Football League (NFL). He was drafted by the Houston Texans first overall in the 2002 NFL Draft. He played college football at Fresno State. Carr also played professionally for the Carolina Panthers, New York Giants, and San Francisco 49ers. He received a Super Bowl ring as a backup for the Giants after their victory over the New England Patriots in Super Bowl XLVI. Carr's status as a number one draft pick and subsequent career has led to him being considered a draft bust. David Carr attended Valley Oak Elementary School in Fresno, California. He continued on to Clovis Unified's Kastner Intermediate School in Fresno, where he proceeded to break a number of California D-I middle school records as quarterback of the Thunderbirds. After moving to Bakersfield, California, Carr attended Stockdale High School. Stockdale High School (SHS) is an American senior high school located in Bakersfield, California. Its athletics teams are known as the Stockdale Mustangs and the school colors are black and silver. Stockdale High School first opened in 1991. Now in its 28th year, with approximately 2,069 students enrolled, has an API of 831, and has earned a reputation in the community and around the state as a school that meets the needs of all students. Sixty-four sections of GATE, Honors, and Advanced Placement classes are offered for the college-bound. For students interested in career pathways, eight courses are offered, including Agricultural Science and Technology, Applied Engineering and Design, Computer and Commercial Graphics, Computer Science and Information Systems, Accounting and Finance, Medicine, Virtual Business Enterprise, and Construction Technology. The school motto is "Branded by Excellence." In 2010, Newsweek ranked Stockdale among the top 6 percent of all public schools in the United States. Redshirt, in United States college athletics, is a delay or suspension of an athlete's participation to lengthen their period of eligibility. Typically, a student's athletic eligibility in a given sport is four seasons, like the four years of academic classes typically required to earn a bachelor's degree at an American college or university. However, in a redshirt year, student athletes may attend classes at the college or university, practice with an athletic team, and "suit up" for play – but they may compete in only a limited number of games,. Using this mechanism, a student athlete has at most five academic years to use the four years of eligibility, thus becoming what is termed a fifth-year senior. 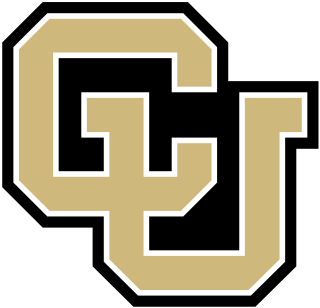 The Colorado Buffaloes football program represents the University of Colorado Boulder in college football at the NCAA Division I FBS level. The team is currently a member of the Pac-12 Conference, having previously been a charter member of the Big 12 Conference. Before joining the Big 12, they were members of the Big Eight Conference. The CU football team has played at Folsom Field since 1924. The Buffs all-time record is 694–493–36 prior to the Valero Alamo Bowl at the end of the 2016 season. Colorado won a National Championship in 1990. The football program is 23rd on the all-time win list and 30th in all-time winning percentage. On September 1, 2007, the Fresno State Bulldogs retired Carr's #8 jersey in his honor. Former Fresno State football player Robbie Rouse (a junior in 2011) was the last player allowed to wear the number. Robbie Rouse is an American football running back who is currently a free agent. He played his college football at Fresno State University. With the first overall pick of the 2002 NFL Draft, the Houston Texans, a new expansion team, selected Carr. His professional career began on a productive note. The Texans played their first regular season game on September 8, 2002, defeating the Dallas Cowboys, 19–10, at Houston's Reliant Stadium. Houston became just the second expansion team to win its first game. Carr was sacked 76 times in the season, an NFL record for most times a quarterback had been sacked in a season. He also set the NFL record for fumble recoveries in a single season, recovering 12 of his own, both records still stand as of 2018. He finished his rookie year of 2002 with 2,592 passing yards, 9 touchdowns, and 15 interceptions. He also rushed for 282 yards along with 3 rushing touchdowns. The Texans finished 4-12 in their first franchise year. Carr under center for the Texans in 2006. In the 2003 season, Carr played 12 games (11 starts) with 2,103 passing yards, 9 touchdowns, and 13 interceptions. He also rushed for 151 yards with 2 rushing touchdowns and was sacked only 15 times. The Texans finished 5-11 in 2003. The 2005 season began poorly as the Texans were 1-9 in their first 10 games, and plummeted to a 2–14 record to finish the season. Plagued by injuries and an ineffective offensive line that limited both the running and passing games, Carr still threw for 2,488 yards while being sacked a league-leading 68 times. Despite the drop-off, the Texans exercised an option in Carr's contract that extended him for three years. The Texans finished the 2006 season at 6–10. For the season, Carr posted a completion percentage of 68.9% (a career-high) and tied the single-game NFL record of 22 consecutive pass completions (against the Buffalo Bills). However, new Texans general manager Rick Smith decided to go in a different direction at quarterback. Thus, the Texans acquired Matt Schaub from the Atlanta Falcons and decided to release Carr, making him a free agent for the first time of his career. He had been sacked a total of 249 times during his tenure in Houston. His brother, Derek is the starting quarterback for the Oakland Raiders. Derek states that David was instrumental to the preparation and training that led up to the 2014 NFL draft  and has helped greatly with training and experience since being drafted by the Raiders. Trent Farris Dilfer is a former American football quarterback and analyst who played 14 seasons in the National Football League (NFL). He is best known as the starting quarterback for the Baltimore Ravens during their Super Bowl-winning season in 2000 and his time with the Tampa Bay Buccaneers. Matthew Rutledge Schaub is an American football quarterback for the Atlanta Falcons of the National Football League (NFL). He played college football for the Virginia Cavaliers, and was drafted by the Falcons in the third round of the 2004 NFL Draft. He has also played for the Houston Texans, Oakland Raiders and Baltimore Ravens. Kenneth Simon Dorsey is a former American football coach and quarterback. He is currently the quarterbacks coach for the Buffalo Bills of the National Football League (NFL). Dorsey played college football for the University of Miami, where he was a two-time Heisman Trophy finalist. He was drafted by the San Francisco 49ers in the seventh round of the 2003 NFL Draft, and played for the Cleveland Browns from 2006 to 2008. He was then the quarterbacks coach for the Carolina Panthers from 2013 to 2017. Matthew Erickson Moore is a former American football quarterback. He was signed by the Dallas Cowboys as an undrafted free agent in 2007, and has also played for the Carolina Panthers and Miami Dolphins. He played college football at UCLA and Oregon State. Christopher Don Houston is a former American football cornerback who played in the National Football League (NFL). He played college football at Arkansas, and was drafted by the Atlanta Falcons in the second round of the 2007 NFL Draft. Houston was also a member of the Detroit Lions and Carolina Panthers. Joshua Javon Johnson is an American football quarterback who is currently a free agent. He played college football at San Diego, and was drafted by the Tampa Bay Buccaneers in the fifth round of the 2008 NFL Draft. Considered a journeyman quarterback, Johnson has also been a member of the San Francisco 49ers, Sacramento Mountain Lions, Cleveland Browns, Cincinnati Bengals, New York Jets, Indianapolis Colts, Buffalo Bills, Baltimore Ravens, New York Giants, Houston Texans, and Oakland Raiders. Despite playing for over ten teams during his NFL career, he did not win his first game as a starter until his 11th season. Brian Axel Hoyer is an American football quarterback for the New England Patriots of the National Football League (NFL). He was signed by the Patriots as an undrafted free agent in 2009 and returned in 2017. He played college football at Michigan State. A journeyman quarterback, Hoyer has also played for the Pittsburgh Steelers, Arizona Cardinals, Cleveland Browns, Houston Texans, Chicago Bears, and San Francisco 49ers. He won Super Bowl LIII with the Patriots as the backup to Tom Brady. Connor Alfred Barwin is an American football outside linebacker who is currently a free agent. He played college football at Cincinnati, and was drafted by the Houston Texans in the second round of the 2009 NFL Draft. He has also played for the Philadelphia Eagles, Los Angeles Rams, and New York Giants. Joseph Webb III is an American football quarterback for the Houston Texans of the National Football League (NFL). He also plays as a wide receiver and kick returner. After having played college football for the UAB Blazers, Webb was drafted by the Minnesota Vikings in the sixth round of the 2010 NFL Draft as a quarterback. He has also played for the Carolina Panthers and Buffalo Bills. Blaine Williamson Gabbert is an American football quarterback for the Tampa Bay Buccaneers of the National Football League (NFL). He played college football at Missouri before leaving early for the 2011 NFL Draft after his junior year. He was drafted by the Jacksonville Jaguars in the first round with the 10th overall pick. He has also played for the San Francisco 49ers, Arizona Cardinals, and Tennessee Titans, starting at least three games for all of them. Thomas Benjamin Savage is an American football quarterback for the Detroit Lions of the National Football League. He was drafted by the Houston Texans in the fourth round of the 2014 NFL Draft. He played college football at Rutgers, Arizona, and Pittsburgh. Derek Dallas Carr is an American football quarterback for the Oakland Raiders of the National Football League (NFL). He was drafted by the Raiders in the second round of the 2014 NFL Draft. He played college football at Fresno State, as did his older brother, former NFL quarterback David Carr. 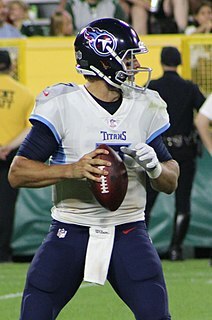 Taylor Jonathan Yates is a former American football quarterback who is currently an offensive assistant with the Houston Texans. He played college football at North Carolina and was drafted by the Houston Texans in the fifth round of the 2011 NFL Draft. 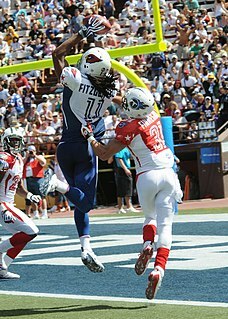 He has also played for the Atlanta Falcons, Miami Dolphins, and Buffalo Bills. Connor Cook is an American football quarterback for the Detroit Lions of the National Football League (NFL). He played college football for the Michigan State Spartans and was their starting quarterback from 2013 to 2015. He holds the record for most career wins at Michigan State. Cook was selected in the fourth round of the 2016 NFL Draft by the Oakland Raiders. After initially serving as the third-string backup to Derek Carr and Matt McGloin, Cook played in his first NFL game in the Raiders' last regular season game of the 2016 NFL season after Carr and McGloin suffered injuries. Following this, he was named the starter for the Raiders' playoff game against the Houston Texans and became the first quarterback in NFL history to make his first career start in a playoff game. 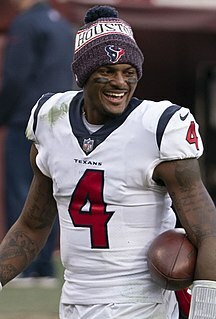 Derrick Deshaun Watson is an American football quarterback for the Houston Texans of the National Football League (NFL). He played college football at Clemson and led the team to a CFP championship game appearance in 2015 and a national championship win in 2016. He was selected by the Texans 12th overall in the 2017 NFL Draft. In 2018, his second year, Watson was named to his first career Pro Bowl. Kyle Allen is an American football quarterback for the Carolina Panthers of the National Football League (NFL). He played college football for the Texas A&M Aggies and Houston Cougars. Justin Quintin Reid is an American football safety for the Houston Texans of the National Football League (NFL). He played college football at Stanford. ↑ "David Carr". pro-football-reference.com. Sports Reference LLC. Retrieved March 21, 2018. ↑ "Fresno? Yep. Unheralded Fresno State is knocking off college football's big boys". Sports Illustrated . September 17, 2001. ↑ "David Carr College Stats - College Football at Sports-Reference.com". College Football at Sports-Reference.com. ↑ "Joey Harrington Finishes Fourth In Heisman Balloting". Pac-12. ↑ Gustines, Elena Aida; Bierman, Fred (December 29, 2001). "The Fastest, the Strongest, the Best" – via NYTimes.com. ↑ "Derek Carr's childhood dream realized as Fresno State retires No. 4". ↑ "NFL Sacked Single-Season Leaders - Pro-Football-Reference.com". Pro-Football-Reference.com. ↑ "NFL Fumbles Recovered Single-Season Leaders - Pro-Football-Reference.com". Pro-Football-Reference.com. ↑ "2004 Houston Texans Statistics & Players - Pro-Football-Reference.com". Pro-Football-Reference.com. ↑ "Texans release QB Carr". ESPN.com. March 23, 2007. ↑ "Carr agrees with Panthers, will back up Delhomme". ESPN.com. April 6, 2007. ↑ Battista, Judy (October 5, 2007). "Two Players, Not Active, Suspended by N.F.L." – via NYTimes.com. ↑ "Testaverde's comeback is one for the ageless". ↑ "QB-needy Panthers agree to deal with Testaverde". ESPN.com. October 10, 2007. ↑ "Carolina releases QB David Carr". The Seattle Times . February 28, 2007. Retrieved March 9, 2010. ↑ "Giants sign former No. 1 overall pick Carr" . Retrieved April 27, 2018. ↑ "Bye-bye, Battleship!" . Retrieved April 27, 2018. ↑ "Madison, Knight, Droughns cut". ESPN.com . February 9, 2009. Retrieved March 9, 2010. ↑ "David Carr: Career Stats at NFL.com". www.nfl.com. Retrieved April 27, 2018. ↑ "Quarterback David Carr agrees to terms on a contract with San Francisco 49ers after two years with NY Giants". NJ.com. ↑ "Alex Smith Hurt" . Retrieved April 27, 2018. ↑ "San Francisco 49ers kicker Joe Nedney expected to retire; David Akers added". July 28, 2011. Retrieved April 27, 2018. ↑ "Giants confirm re-signing of backup QB Carr" . Retrieved April 27, 2018. ↑ "Silence was golden for Carr before SB XLVI" . Retrieved April 27, 2018. ↑ "David Carr - Unsigned Free Agent - 2015 Player Profile - Rotoworld.com". rotoworld.com. ↑ "David Carr driven out of New York by Giants" . Retrieved April 27, 2018. 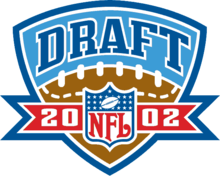 ↑ "NFL Draft 2013: Meet Ryan Leaf, JaMarcus Russell and the biggest busts ever". Sporting News . Retrieved December 22, 2015. ↑ "NFL's Biggest Draft Busts". Daily News . New York. Archived from the original on December 22, 2015. Retrieved December 22, 2015. ↑ Leahy, Sean (April 26, 2011). "Huge mistakes: The 25 biggest NFL draft busts of past 15 years". USA Today . Archived from the original on March 12, 2015. Retrieved December 22, 2015. ↑ "Biggest NFL Draft Busts of the Modern Era". SI.com. Retrieved August 31, 2016. ↑ "19 of the biggest NFL Draft busts ever". CBS Sports. Retrieved August 31, 2016. ↑ "10 worst No. 1 picks in NFL draft history". msn.foxsports.com . April 19, 2011. Retrieved October 29, 2011. ↑ "David Carr, Ki-Jana Carter Among Eight Worst No. 1 NFL Draft Picks". NESN . Archived from the original on October 22, 2015. Retrieved December 22, 2015. ↑ "Darren Carr named football coach at BCHS; brother David will be ... - The Bakersfield Californian". December 17, 2015. Archived from the original on December 17, 2015. Retrieved April 3, 2018. ↑ "Fresno State Football's Quarterback David Carr's Family Express - Fresno State". Fresno State. ↑ "ESPNMAG.com - ESPN The Magazine: Dream On". www.espn.com. ↑ "David Carr". July 31, 2004. ↑ Duarte, Joseph (April 13, 2005). "David Carr takes son's battle with diabetes public". Chron.com. Retrieved April 26, 2018. ↑ "Featured WAG Melody Carr-Supermom, Superwoman, Superstar". ↑ "Sins of the brother - Derek Carr must learn from brother David's busted career". ESPN.com. ↑ "Derek Carr bloodlines run "Black and Silver"" . Retrieved April 27, 2018. Wikimedia Commons has media related to David Carr .